Anne, Now from KnitTraders of Kingston: Faces of "Art"
you're just stretching your soul." I love the wisdom of Maya Angelou. 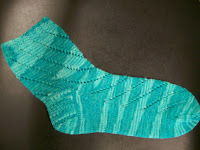 Then about 3/4 of the way through the sock my disciplined self took over and I realized that in order to make this a practical exercise - timewise - that I should write out the pattern down and offer it on our free pattern website some month. So I finished the sock and loved it. Took pictures of it and began the 2nd one, dilligently writing out directions as I went along. I really didn't have any trouble until it came time to describe what to do at the gusset to incorporate the eyelet pattern, and then I was stumped. I know that these are absolutely not difficult socks and writing the pattern really isn't rocket science, and I've certainly written more complicated patterns than this for myself, but I just simply ran out of time, energy, motivation, whatever else you want to add to this list to keep perfecting and reviewing the pattern so that I wouldn't be leading my lovely customers into a quagmire of knitting confusion. This experience had me thinking about all the different levels of at which we can create and appreciate "art", and that each level has its value and each has its lessons to teach us. Writing a perfect pattern that is clear and rich in how it conveys the designer's intention is a work of art in itself, and one which I've always admired and I strive to work towards it. Needless to say, the spiral eyelet sock pattern was not one of my successes in this journey. Some of you may recognize her Madonna and Child, as we have a copy of the picture at the store. An amazing aspect of this piece is that it is life size, with Mary being about 5 feet tall. And from a knitter's perspective, an even more amazing thing is that the artist has woven in all of those ends (how many hundreds do you think that there are?) on the good side of the work, to amazing effect. Obviously, the challenges in creating these socks were many. Not only did she need to conceive and complete the design, which most of us can admit comes from another knitting galaxy, but by virtue of the fact that they would be published in a book the pattern needed to accompany the project. Debbie had to invent an entirely new system of knitting notation to explain how to "recreate" them for the bravehearts who would take on such a challenge. Posted by Now: KnitTraders of Kingston at 10:13 a.m.